Former opposition leader Sam Rainsy wrote to King Norodom Sihamoni, asking him not to heed the government’s call for the public to participate in the July election. “I allow myself to write to you to respectfully ask you not to cede to the demand of the government and the CPP which seeks your intervention to encourage Cambodia’s population to go to the polls on July 29,” Mr Rainsy said in a Facebook post last week. “The government and the CPP are already starting to put increasing pressure on the population to take part in an election,” Mr Rainsy added. Yesterday, several political party leaders lashed out at Mr Rainsy over his calls for voters to boycott the poll. “Voting is a core element for free elections as well as allowing political parties to contest the election,” said Yeng Virak, president of the Grassroots Democratic Party. The Supreme Court dissolved the CNRP in November and banned its 118 senior party members from politics for five years after its leader Kem Sokha was arrested on treason charge and accused of colluding with the United States to overthrow the government through a colour revolution. Hang Vitou, a political analyst, said that Mr Rainsy would fail because the King was neutral and could not take sides with any political parties. “It has no influence at all because it is Sam Rainsy’s private letter,” Mr Vitou said. Sok Eysan, spokesman for the ruling Cambodian People’s Party, said that Mr Rainsy’s letter had no impact on the election. 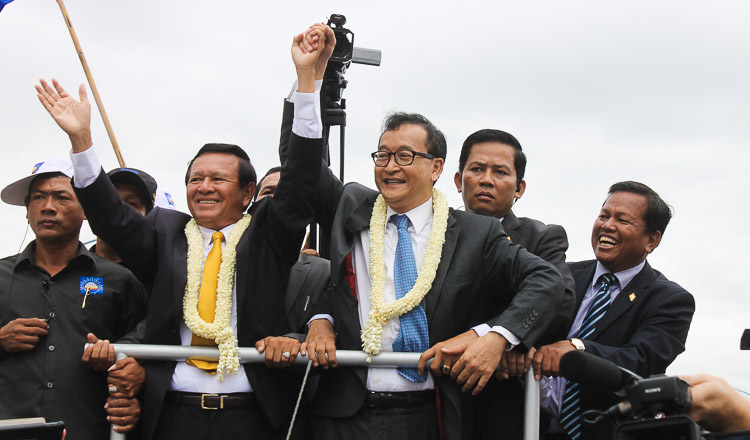 “Sam Rainsy is in a corner and he cannot find his way out. We think that his appealing to the public to boycott the election is of no influence,” Mr Eysan said. “The letter is an insult to the King’s honour because he understands all the meaning stated in the constitution so his Majesty the King will appeal to the public to go to vote,” he added.